A lot of our work is tracking the numerous roll-outs and monitoring the speeds of the different broadband packages, but buried in that data there is now 7 years of information on how popular the different technologies are. As with all crowd sourced data a single data point could be an anomaly but by being able to show the trend between Q1 2012 and Q1 2019 it is easy to see the pattern. In numbers the Q1 2019 split for the UK was ADSL/ADSL2+ 24.8%, FTTC 54.5%, G.fast 0.1%, Cable 17.2%, FTTP 3.1% and wireless 0.3%. The low figure for G.fast explains why its vanished on the chart, but given G.fast is invariably rolled out to areas where we know people can get 60 Mbps or better from FTTC and invariably have Virgin Media as an ultrafast option take-up is likely to a slow process. As the FTTP Fibre First roll-out from Openreach gets going it will be interesting to see if the pull of full fibre makes for a different take-up rate ahead of any bulk migrations. The obvious stand out is that ADSL/ADSL2+ services are becoming less popular and if the trend continues in another 3 or 4 years we may be down to 10% or less of speed tests seen as using ADSL or ADSL2+ and this is before any bulk migrations to the more modern services has taken place. What is revealing is that if you consider ADSL and FTTC services as the Openreach local loop their overall share has been pretty static since 2013. Spotting the full fibre (FTTP) prior to 2015 is a case of zooming into the full size image but starting in 2016 the trend is clear - full fibre is arriving and is starting to squeeze the other technologies. We have also done the same trend analysis for the different local authorities and picking one at random we landed on Suffolk which shows the emergence of full fibre and in Suffolk the full fibre is largely via the BDUK project along with some new build. Does this mean cable broadband is being squeezed and has shrinking customer numbers? We don't think so, there may be some churn but with the rural full fibre those people do not have a Virgin Media option so the 'squeezing' is probably those who did not have broadband at all previously or was too slow to register above zero on the speed test and thus the broadband population is now larger. 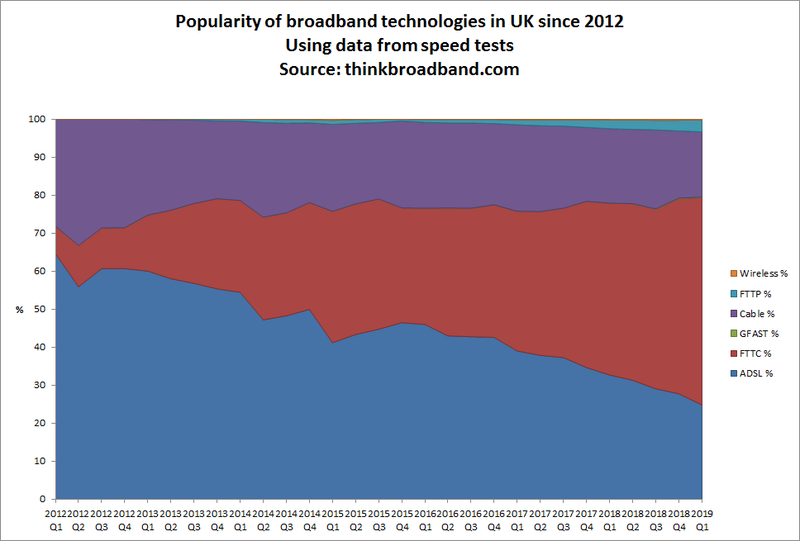 Also interesting to see what appears to be a decline in cable. That's rather surprising given their roll-out. Suggestive of a decline but as we mention in the bit about Suffolk may also be because broadband population is increasing, ie. it may be their expansion is enough to keep market share stable but not enough to cope with more rural areas going online via FTTP. The key will be in another year when more urban FTTP is overlapping with the cable footprint, so some CityFibre and FibreFirst areas will be interesting and for FibreFirst the real test will be areas that had no VDSL2 and just ADSL2+ or Virgin Media. 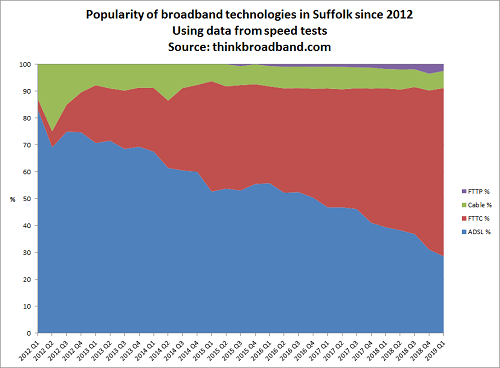 The other factor that might be at work in Suffolk is the number of properties using mobile instead of fixed broadband. I presume you cannot distinguish premises that only have mobile from those who have both mobile and fixed. If we count mobile as its own grouping then would be 0.5% of tests in Suffolk in Q1 2019 and may be marginally higher than 2016/2017. So not a significant factor particularly if we were to remove those where superfast speeds are also available, which would shrink the figure further. Interesting figures, thank you TBB for this insight. I think my own Plusnet is only one of several ISPs offering FTTC for the same price as ADSL2 last year, someone said that ISPs can receive extra payment for this move which helps to meet Govt targets. This is bound to drive the move away from ADSL. PlusNet is NOT offering ADSL2+ for the same price as FTTC to new customers. £18.99/m ADSL2+, FTTC £23.99/m at present and £75 reward on ADSL and £45 on FTTC. Maybe an existing customer may get a retention deal, but that is very different to standard pricing. As for the extra payment, Openreach has an incentive scheme to get more people onto the 80/20 product, this may be what you are referring too.